SPOKANE, Wash. – Crime prevention theories suggest that when a burglar decides to rob a house, he or she chooses a home that gives passers-by a poor view of entry points such as doors, windows and garages. 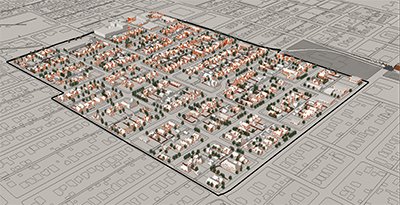 A Washington State University doctoral student wants to test that hypothesis by modeling areas of poor visibility and predicting favorite targets in hopes of helping people protect their homes and property. Photos are from the neighborhood 3-D digital model that graduate student Solmaz Amiri has created. Solmaz Amiri has created a digital 3-D model of a Spokane neighborhood that shows how lines of sight intersect with windows, doors and other potential points of entry for a burglar. Now she is working with the Spokane Police Department to look at five years of burglaries in the area to find out if homes with low visibility entryways did experience more crimes. Amiri is particularly interested in the relationship between environmental factors and crime in low-income neighborhoods, so she is mapping one of the highest crime neighborhoods in Spokane. Over the past nine months she developed the 3-D model. A recent fellowship from the National Institute of Justice (NIJ) will allow her to develop a visibility index and compare her predictions to actual crime trends in the neighborhood. Her work could provide police with better information about how homeowners can protect their property by perhaps increasing visibility of entry points or increasing security around target areas. Advising residents on effective strategies to protect their property could also help police build stronger relationships with community members. In addition to funding, NIJ also sent Amiri to a meeting of the National Association of Crime Analysts in September to present her project to industry professionals. “They were very interested in being able to predict where crimes happen because then they would better know where to allocate policing resources,” she said. By August 2014, Amiri hopes to have developed a predictive model that will help law enforcement be more effective in policing and reducing property crimes.